Pineapple is a versatile fruit, symbolizing hospitality and offering a number of important health benefits that can do everything from giving your immune system a boost to preventing disease. 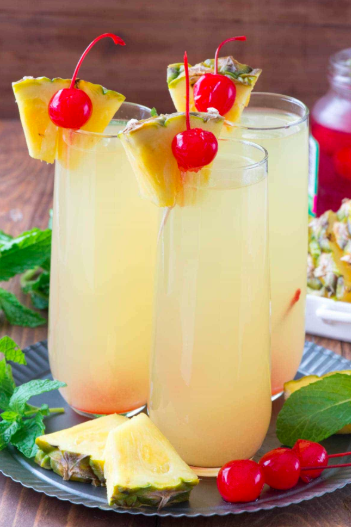 Add the Perfect Pineapple to your New Year’s traditions and ring in 2019 with health and good cheer. A perfect sipping libation as the ball drops, or to sip on as spring makes its way back to our hemisphere, we have a few of our favorite recipes ready to shake up your holidays. According to feng shui practitioners, certain “lucky” fruits symbolize each month of the year, bringing prospects from money to health and happiness. The Chinese word for pineapple is “ong-lai,” which means “fortune cones,” and according to feng shui masters are a necessary item when preparing your home for the New Year. Bring luck to your loved ones as you ring in the New Year with a fun twist on the classic mimosa below. Cheers!